In the Agreement the West Goshen Sewer Authority agreed to implement a new technology (CoMag ballasted flocculation system) to reduce phosphorous in Goose Creek. Goose Creek has been impaired for phosphorous and this technology as well as buffer plantings is designed to protect aquatic life and the health of the stream. DRN, et al. v. PaDEP and Portland Borough (Pennsylvania EHB appeal numbers 2003-083-MG; 2003-299-MG): Appeal of Act 537 Plan and NPDES permit for the construction of a Sewage Treatment Plant and its related discharge of treated effluent in the Delaware River that is soon to be designated Special Protection Waters by the Delaware River Basin Commission (DRBC) Although we lost the actual decision in this case, our litigation resulted in a change in the way the DRBC reviews 537 Plans. On August 16, 2014, the Department of Environmental Protection published in the Pennsylvania Bulletin the Department’s approval of Range Resources—Appalachia, LLC’s, registration for coverage under a Residual Waste General Permit 097 authorizing what are supposed to be “research and development activities” to support the “beneficial use” of Marcellus Shale drill cuttings. The specific project that was the subject of the approval was for use of drill cuttings in construction of a well pad in an Exceptional Value watershed. 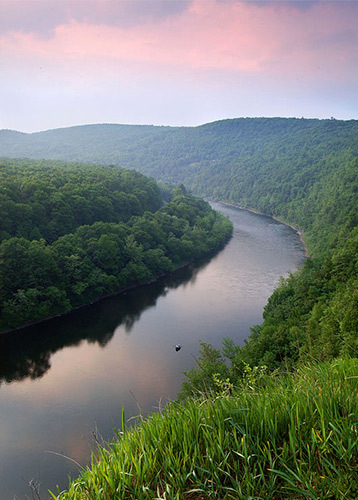 On September 15, 2014, the Delaware Riverkeeper Network, Maya van Rossum, the Delaware Riverkeeper, Earthworks and Stewards of the Lower Susquehanna filed an appeal of that registration with the Pennsylvania Environmental Hearing Board. In a letter filed with the Pennsylvania Department of Environmental Protection (“PA DEP”), Synagro MidAtlantic (“Synagro”), a biosolids management company, has withdrawn plans to dump sewage sludge on three farms located in Upper Mount Bethel Township, Northampton County, PA.
Delaware Riverkeeper Network took successful legal action to compel the PA Department of Environmental Protection(PADEP) to comply with Anti-degradation and Sewage Facility Act requirements. In 2009, DRN successfully resolved an ongoing legal case. In 2008 the Delaware Riverkeeper Network teamed with the Public Interest Law Center of Philadelphia (representing the Northern Liberties Neighborhood Association and neighbor Herbert Shallcross) to challenge the DEP’s approval of a sewage facilities planning module that accommodated development of the proposed SugarHouse Casino on the banks of the Delaware River. The legal action took the form of an administrative appeal to the Environmental Hearing Board, filed on November 3, 2008. On March 31, 2011, Tennessee Gas Pipeline L.L.C. submitted its certificate application for the Northeast Upgrade Project to the Federal Energy Regulatory Commission. The Project was one of a series four interconnected pipeline projects Tennessee launched in a three year span to add a new 30-inch diameter pipeline beside its existing 300 Line natural gas pipeline. On February 12, 2019, the Delaware Riverkeeper Network (DRN) defeated a motion to dismiss filed by Sunoco Pipeline L.P., thus allowing the case to proceed. DRN’s complaint was filed in June 2018 against Sunoco for their failure to obtain a National Pollutant Discharge Elimination System Permit (NPDES permit) for the Mariner East 2 pipeline project. Victory for Groups that Sued EPA to Require the Oil and Gas Extraction Industry to Report to the Federal Toxic Release Inventory Announced: October 27, 2015 In response to a petition and lawsuit by environmental and open government organizations, the U.S. Environmental Protection Agency will propose regulations requiring natural gas processing plants to start reporting the toxic chemicals they release.